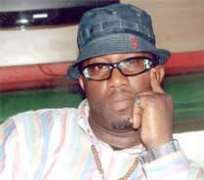 Ernest Asuzu, remember him? The Nollywood bad boy is back and guess what? He has completed work on his brand new album. “I am the Don, I call the shots,” he told ShowBuzz recently, “I have contributed to a lot of artistes careers, I have encouraged a lot of artistes in music, Nollywood and modeling. I don't want to mention names so it's not like I am sounding off. Tracks in The Return of The Don his new album include Here I come Again, Danger Zone, How E Go Be, and Take Over.